Interior Finishing is wrapping up for the new 20 unit luxury condo building in Brighton adjacent to Boston Landing. The project will include a mix of two and three bedroom units each with a private balcony. The building will also feature a common roof deck and a 26 car garage. 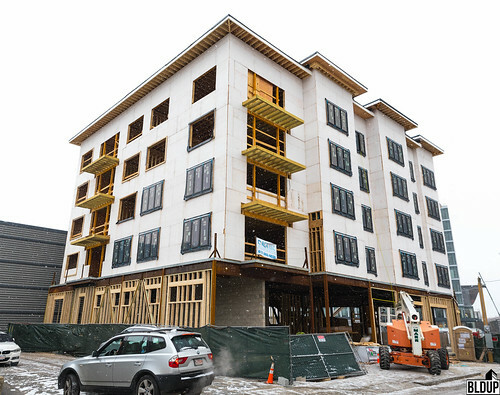 Exterior finishing complete along the five-story facade of 24-26 Hichborn Street, a 20-unit condominium building located adjacent to the 15.2-acre Boston Landing development in Brighton. Installation of interior finishes within residences and common spaces are underway. The building will also contain approximately 1,800 square feet of ground-floor retail space, with a 26-space underground vehicle parking garage. A small project review application was submitted to the Boston Redevelopment Authority on Thursday to construct a new mixed-use development at 24-26 Hichborn Street in Boston's Brighton neighborhood. The development team hopes to start construction in spring 2016. Project site is located adjacent to Boston Landing.